There is a Family Circus cartoon that I've always loved with the caption: "Yesterday's the past, tomorrow's the future, but today is a gift, that's why it's called the present." Everyone likes to receive presents. So how can we practice treating today as a gift? Bonus if we get cake or ice cream, since it goes so well with presents. There's a real struggle. So much of what we do each day: working, planning, saving, spending, praying and even exercising, is for the future. We lose track of today because we're so focused on what's next. On the flip side, our culture, especially in social media, focuses on capturing and sharing the minutiae of today....things that in years past (and I'm talking a few years, not 90 years) we wouldn't have shared, other than in passing conversation, as in "Did you see those shoes?" or "Wasn't that pie delicious?" or "Did you see my child / dog / best friend do that cute / crazy / ridiculous thing?" Now if you do that crazy thing someone is bound to get it on video. Just one more reason to be glad that I was in college before smart phones. Today is one of the building blocks of our life story. When you sit down with friends for coffee, or your family at the holidays, you jump straight to the memories and stories that come from each miraculous day of living. Today is one of those miraculous days...even if it doesn't feel like it. This year, I'm focusing on capturing the gift of today. I've got a bowl on my bookshelf that I pass multiple times per day (my ohana apartment is cozy....I pass by everything I own in about 30 seconds). I write down one joy per day. Big or small. It's my present. By the end of January, I will have hit the 30 days necessary to form a habit....so that bowl should be full come December. What will it be like next January going through this bowl and looking at all the presents? I won't know until I get there, but I imagine there will be a lot of laughing. How do keep yourself present in today? 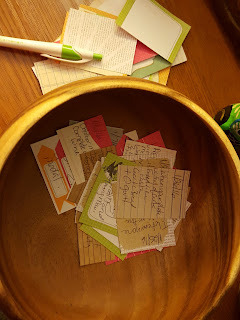 Like doing something new by starting the bowl of joy, I'm trying to extend and stretch myself this year. 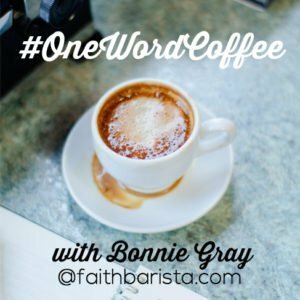 I was inspired to write this by the #onewordcoffee series on Faith Barista.